I have super thick, unruly, dry, long, frizzy just not very nice hair naturally. But throughout the years I have found some really good products that leave me silky, soft manageable hair! I love hair care posts so today I thought i'd share one with you! Research suggest that the best shampoo for dry or damaged hair is one that doesn't contain sulphate (a cleaning agent) because this can strip the hair and leave it dryer and inturn weaker. I have tried sulphate free shampoos but because I use lots of products I need a good shampoo to prevent product build up. But if you don't have overly thick or unruly hair then I would recommend a sulphate free one! My shampoo of choice at the moment is this Garnier one. To tell the truth I've never overly noticed dramatic results from a shampoo alone. But I like the smell of this one and it's very affordable! For conditioner I've been loving this argon oil one from Maple Holistics. This obviously contains argan oil, jojoba oil and a whole host of other hair loving ingredients to help smooth, nourish and add shine. And this really does. As soon as I start rinsing this of I can feel how soft it has made my hair. Which I think is amazing for a normal conditioner! This also doesn't contain sulphates or silicones. Silicone in hair products doesn't offend me but this is a winner for those who like to avoid them! This my holy grail of hair masks! I never found one that leaves my hair in amazing condition like this one does! This miracle in a tub contains proteins and moisturizers to nourish the hair and thus, encourage hair to grow. I don't use this to help my hair grow nor have noticed it help my hair grow any quicker. But this just leaves my hair so soft, silky, smooth and shiny! I've never tried any hair masks (and I've tried a few in my time) that have come close to this! I use this every time I wash my hair, but if you have finer hair I'd recommend only using it once or twice a week because it may be too heavy on finer hair types. I like to smother my hair in this after shampoo and conditioner and leave as long as possible (usually around 15mins). Leave in conditioner is another product my hair can't go without. And it frigging loves this offering from Aussie. It claims to be a saviour for weak, distressed hair. It contains many hair loving ingredients including jojobia seed oil to help detangle and nourish the hair while reducing drying time. As well as having heat protecting properties. This literally cuts blow drying time in half! Which is a life saver because my hair is so thick it takes a while to dry. This also leaves my hair smoother. I spray this liberally on freshly washed damp hair, before styling. This leave in conditioner promises to repair damaged hair and protect from further damage by adding hydration and potiens that are naturally found in the hair. I really like this, when I use this my hair is noticeably shinier and softer! I apply this in the same way as the Aussie Leave in conditioner. This amazing gel crème formula adds essential, moisturising ingredients such as argan oil to lock in moisture and improve the over all condition of the hair. This smooths split ends and leaves my hair brilliantly soft, without weighing it down! And leaves it smelling gorgeous! I apply a 10p sized amount to freshly washed damp hair and style as usual for best results! This purse friendly beauty promises to re strengthen hair, smooth spilt ends and leave hair feeling fortified with the help of honey bee propolis - an ingredient know for its strengthening properties! This can be used as pre wash, nourishing treatment, after washing to seal spilt ends and between washes to smooth and restore shine! I love using this on dry hair between washes to smooth split ends and add shine to my hair! 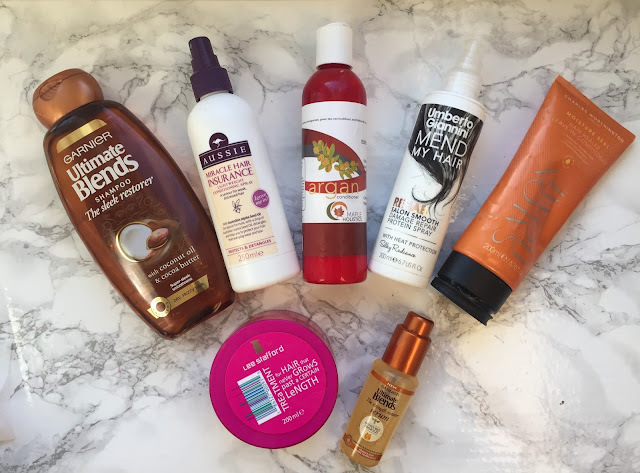 What are your hair care must haves? Leave your recommendations below.. I love trying new hair products!